Die Hypertrophie der synovialen Plicae des Kniegelenks können Blockaden und Impressionen der Knorpelflächen verursachen. Die größte Bedeutung hat dabei die Plica mediopatellaris (medial shelf). Üblicherweise verläuft der diastale Teil der Plica nach ventral hin zum Hoffa-Fettkörper, wo eine Kommunikation zur Plica infrapatellaris möglich ist. Vorgestellt wird ein Fall, bei dem der distale Plicateil oberhalb des Innenmeniskus verlief. Bei sportlicher Betätigung des 27-jährigen Patienten kam es zu einer permanenten Gelenkblockade unter dem klinischen Bild einer Innenmeniskuseinklemmung. Bei der Arthroskopie wurde die atypische Plica vollständig reseziert. Die Falldarstellung zeigt, dass die synovialen Plicae eine atypische Morphologie haben können. 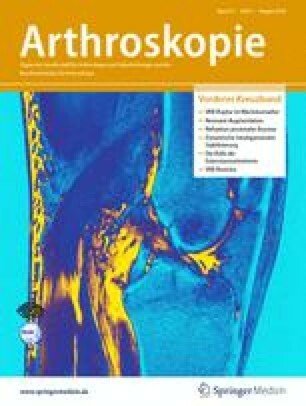 Eine exakte arthroskopische Diagnostik ist dabei Voraussetzung für eine erfolgreiche Therapie. Blockade and impression of the articular cartilage can be caused by hypertrophy of the synovial plicae of the knee. The plica mediopatellaris (medial shelf) is the most importand synovial fold in such pathology. In regular anatomy the distal part of the plica mediopatellaris passes to the fat pad (Hoffa). In this area exist in same cases a communication between plica suprapatellaris and plica infrapatellaris. In this article is demonstrated a case in wich the distal part of the plica mediopatellaris insert above the medial meniscus without any contact to the fat pad. The 27 years old sportsmen suffered on a acute blockade coursed by medial meniscal tear after clinical examination. During arthroscopic procedure the atypical plica was resected completely. This case history make clar that synovial plicae can occur in atypical morphology. Diligent arthroscopic diagnosis is necessary to clear the situation.